Place the flour on a working surface, put the sugar in the middle, the eggs, the cocoa, the milk, the butter and the ammonium bicarbonate, then go on as for the shortcrust pastry. Put the dough in the fridge for some hours. Then pull with the rolling pin a ½ cm-thick sheet of dough, to obtain two disks with a diameter of 20-25 cm. Place them on a baking sheet and cook in the oven at 200°C, for about 20 minutes. In the same way, prepare the mignons. Ingredients for the first filling: whipped cream, custard cream, chips of chocolate, covering, crushed nougat and rhum. Prepare the cream mixing the whipped cream with the custard cream. Add the thin chips of chocolate, the crushed nougat, the rhum and mix well. Put a shortcrust disk on a plate and spread the filling on it. Cover with the other disk and spread the remaining filling over it, levelling it out well on the whole surface and on the edges. Place on the edge a circle of Zurigo mignons filled with some filling. Scrape the dark chocolate with a knife on the cream. 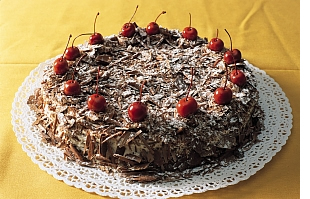 Sprinkle the cake with icing sugar and garnish with cherries preserved in alcohol, placed on the bottom of the mignons.